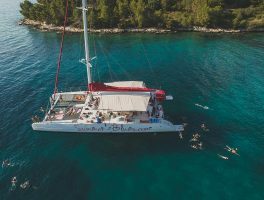 Feel the wind and discover all the beauties of central Dalmatia islands on our full day sailing tours. Meet our team at 9:00 in the morning and start your day with welcome drink. 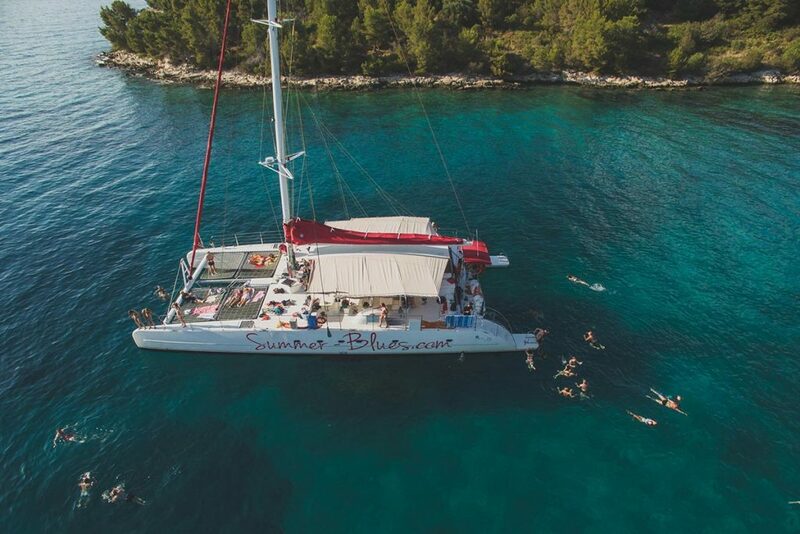 After relaxing cruise along the Adriatic Sea in beautiful environment we will anchor our catamaran and continue inland sighseeing with guided panoramic bus ride or guided walking tour. 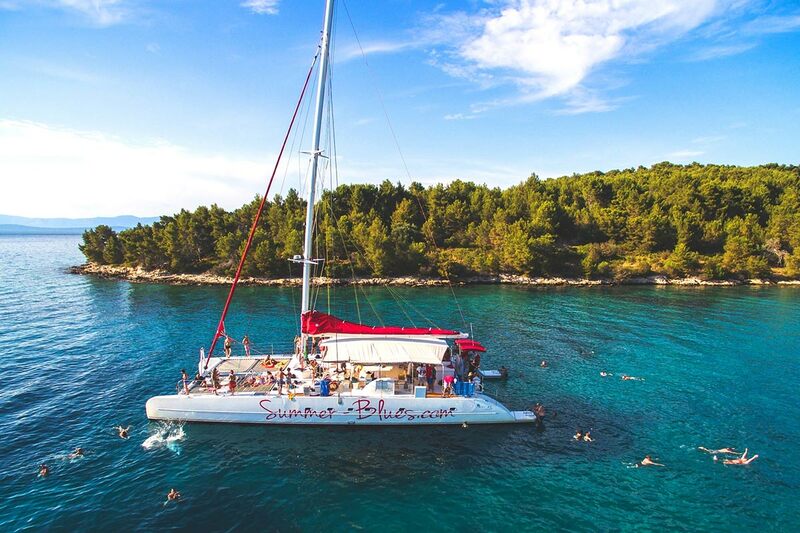 Enjoy several swim stops in crystal clear water of the Adriatic. 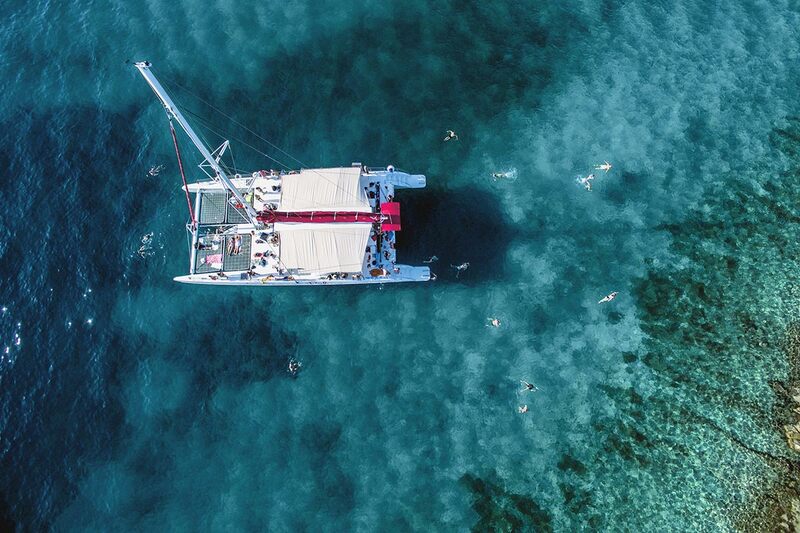 Relax on our boat while soaking the sun rays and waiting for lunch to be served. Island of Brač owns attractions which are extended beyond the beautiful beaches so your journey won’t stop on the first anchor. Climb the Vidova Gora, the highest peak of the island, for breathtaking views of the Adriatic sea. Take a numerous pictures with it’s renowned beach in the background – Zlatni Rat, also known as a Golden Horn. Around 15:00 it’s time for lunch on the catamaran and sailing towards next destination. 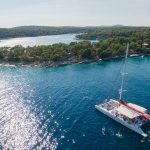 While enjoying breathtaking landscapes during our sailing to the Lučice bay, chicken salad, fruits and drinks will be served. Swim in natural bay „Lučice“ and enjoy in pure paradise. 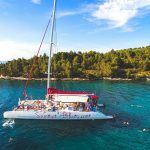 Don’t miss this opportunity to discover one of the most beautiful islands on the Adriatic and spend a great day with our sailing crew. 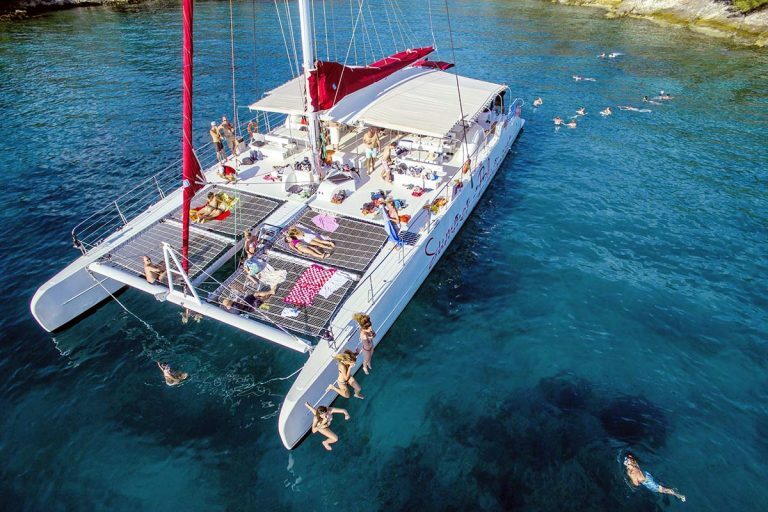 Have you heard about Hvar island and its rich history, beautiful bays and crazy nightlife? Hvar is also well known as the sunniest island in Europe so on this tour soaking up the sun rays won’t be difficult during the whole tour. 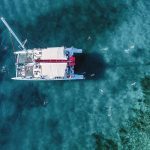 First bay you will enjoy is located on the island of Šolta, the best way to begin hot summer day; dive into the clear blue sea. 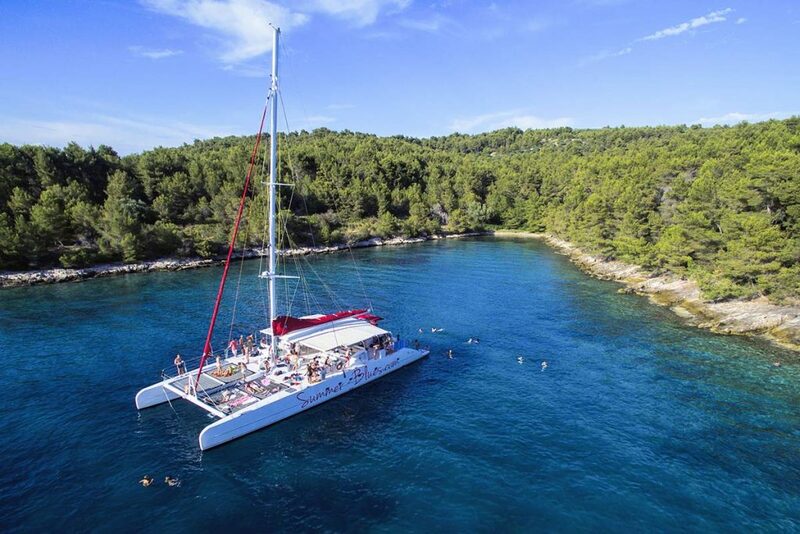 Cruise continues towards famous town of Hvar where you will join guided walking tour and have an opportunity to get more familiar with this renowned city. 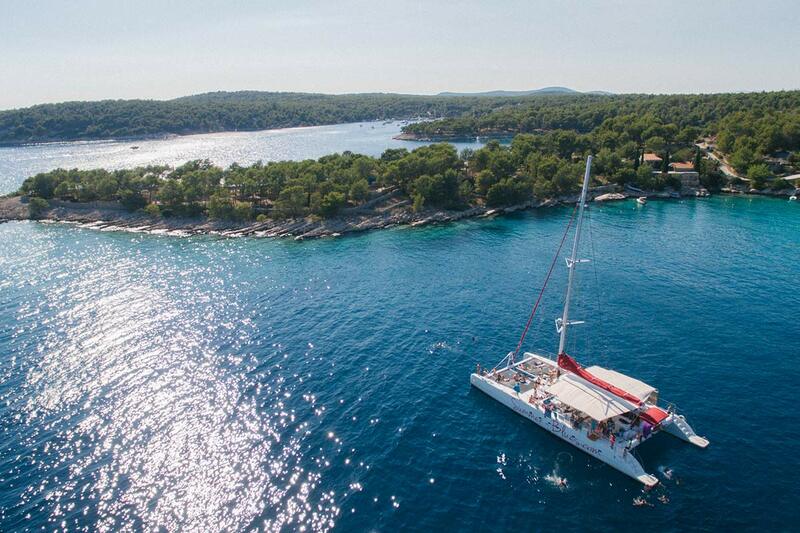 After your free time in Hvar it’s time to discover Pakleni islands and their beautiful hidden spots in this popular inlet. 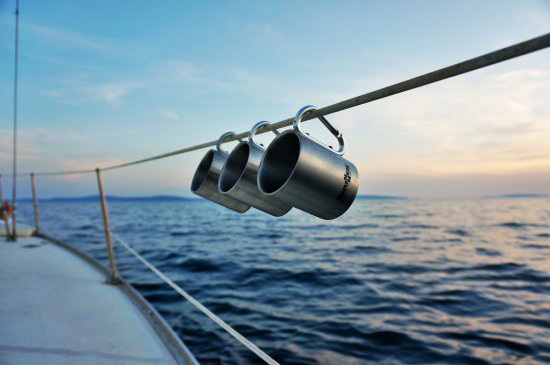 Lunch will be served on the catamaran and there are plenty of cold drinks in our bar. Last stop before heading back to Split is hidden bay on the Brač island. 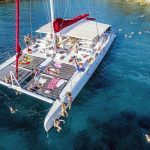 Enjoy the views from the boat, dance with a good music and end this sailing tour in a best possible way. Meeting point is on the main Riva Promenade. Please be there at least 15 minutes before the departure. 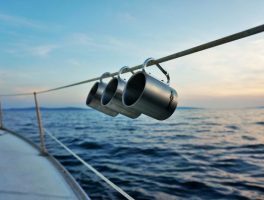 -If you are sensitive to the boat movements please take a pill for a seasickness. -If you are allergic on some of the ingredients or have diet restriction please let us know.